Belief in God is not "properly basic"
Stephen Law's undercutting defeater for “properly basic” belief in God held no sway with his debating opponent Tyler McNabb on last week's Unbelievable? radio show. Stephen Law presented sound philosophical arguments demonstrating that Tyler McNabb's belief was not justified. But Tyler McNabb announced that he was nevertheless going to continue believing it anyway. Towards the end of the discussion host Justin Brierley suggested that perhaps the popularity of “properly basic” belief was that it allowed believers to continue believing while avoiding any requirement to present compelling evidence. In as much as they have a choice (given the unlikelihood of doxastic voluntarism), I think believers can choose between belief on the basis of evidence, or belief on the basis of faith. One or the other, you don't need both. In my view, however, neither will give you a rational basis for belief in God. Labels: Alvin Plantinga, Christianity, evidence, God, Justin Brierley, philosophy, Premier Christian Radio, properly basic belief, religion, sensus divinitatis, sin, Stephen Law, Tyler McNabb, Unbelievable? What the hell is "Darwinian Eugenics"? During the 1930s and 40s, the Lilliput Troupe family of singers dazzled audiences with their unique vaudeville performances. 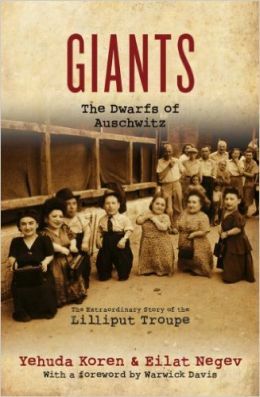 The only all-dwarf show then, their small stature earned them fame—and, ironically, ultimately saved their lives in Auschwitz. After descending from the cattle train in the Auschwitz death camp, the Ovitz family—seven of whom were dwarfs—were separated from the other victims on the orders of Dr Joseph Mengele—a Nazi SS officer and physician with a Ph.D. in anthropology and an obsession with eugenics. Dr Mengele’s reason for being at Auschwitz was so he “would have continual access to an unlimited supply of human specimens” for his genetic research. His “enthusiasm, ambition, charisma and cruelty set him apart from the other death-camp doctors”, and he rose to the position of First Physician of the Auschwitz-Birkenau camp. When the Russian army liberated Auschwitz, the entire Ovitz family was still alive, having been preserved for ongoing ‘study’. Mengele went on the run in Europe, before moving to South America in 1949. He successfully evaded capture for the rest of his life. The authors conclude that “the biggest crime in history was carried out under the direction of leading scientists and distinguished institutions” who, Jerry Bergman points out, were under the spell of Darwinian eugenics. We know Josef Mengele did some terrible things, but implying he was inspired by Charles Darwin is disingenuous to say the least. Darwin formulated the theory of evolution by natural selection. What eugenicists advocate is artificial selection, which has been going on for centuries with selective breeding of, for example, dogs, goldfish, and pigeons. Extending selective breeding to humans may be undesirable, but it has nothing to do with Darwin.